If you have an ethical issue in business that you would like to see posted on the Rock Chalk Ethics Talk Blog, please submit them to rockchalkethicstalk@gmail.com. Email a summary of the issue and any questions that you would like to propose and the moderator will review them for publication. The ICEB recently sent four MBA students to participate in the National Intercollegiate Business Ethics Competition at Loyola Marymount University in LA. The students proposed that the judges (acting as executives at a computer company) initiate a corporate take-back policy for their electric components. 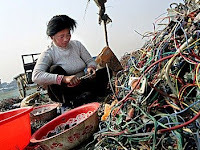 Electronic waste, called e-waste, is one of the world’s fasted growing pollution problems and is not limited to computer parts. E-waste accounts for 70% of America’s toxic garbage and 2% of America’s total garbage. This smaller number, however, may be misrepresented, as much of the e-waste is exported to developing countries like China, India Thailand and Nigeria. Some companies are, in essence, outsourcing their pollution. In 2002 alone, 10.2 million computers were exported for illegal “recycling.” Much of these products end up in landfills where local adults and children find them and melt the valuable (yet toxic) materials down for resale. Harmful chemicals often drain into the soil and groundwater, further hurting the local peoples. Using several systems currently in place in the EU (WEEE), Washington and California as a point of reference, the group argued that it is the company’s responsibility to dispose of this e-waste properly, speaking to ethical, legal and economic issues. Beyond the goodwill produced by such a process, often overlooked is the potential for income generation or cost savings that might also be produced. Who do you think should be responsible for the disposal of electronic components? Do you agree that companies should take the lead? Or should the consumer be held accountable? Should the US adopt the systems currently in place in Europe and California? Could your Facebook or MySpace account hurt your job search? You may have noticed the “disclaimer” posted on the sidebar of this site. It is no coincidence that the first topic here is about personal information listed on the web. Facebook, an online social networking site, that has recently been the big topic on college campuses, in recent publications (Time, The Washington Post & Fast Company to name a few), and now even businesses are onboard. Some companies are using Facebook as a way to reach new customers and to tap the young adult market. Other companies are using Facebook as a way to connect to their employees; future, past and present. What happens when companies get "too personal"? People have been fired for things they’ve said about their company online; others have not been hired because of statements, pictures or opinions posted online. Alison Doyle, on about.com, warns that, “if your blog, web site or profile contains information on your real identity, the people you least expect, and those that you certainly don't want reading it, may find it. Not only your boss and prospective employers, but, also your customers, colleagues and coworkers.” Is it ethical for current or future employers to view your personal information, profile or pictures online? What do you think? This blog was created by the International Center for Business Ethics at the University of Kansas School of Business. The intent of this blog is to allow an open forum for respectful conversation about ethical issues in business. This is a public forum. This means that any person or organization has access to view the topics and comments on the blog. We ask that you understand that any comments made by students, faculty or the public are considered to be in the public domain. By posting comments on this page, it will be assumed that you accept and understand this and that you are aware of any consequences. You may choose to post anonymously for this reason. This blog will be monitored for abusive language or inappropriate comments made toward other people or groups. The Administrator reserves the right to remove or edit any comments made that have been identified as such. That said, this action will only be taken in extreme circumstances, as we would like to maintain a free and unbiased conversation. The discussions on this blog should be based around mutual respect for one another. Everyone is entitled to his or her own opinion and everyone is entitled to respond. Please do so in a responsible manner. You may contact the Administrator with any questions, concerns or suggestions at rockchalkethicstalk@gmail.com.